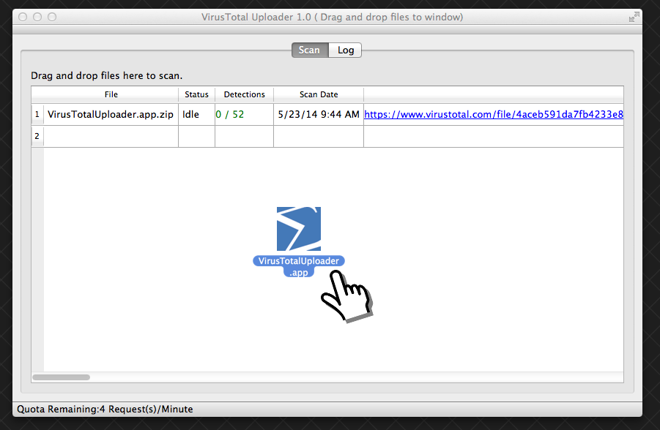 Using the new tool —which has long been available for Microsoft's Windows platform —Mac owners can more easily upload suspicious files for VirusTotal to analyze, which the company hopes will help beef up their database of OS X threats. VirusTotal works with more than 50 computer security vendors, allowing users to subject possible malware to a battery of tests without needing to install multiple desktop scanning applications. According to the company, users can drag-and-drop individual files, entire folders, or even a complete binary application for analysis. Installing VirusTotal will also add a new entry to the "Open With" option in Finder to send a file for scanning from the context menu. The Mac has become an increasingly popular target for malware authors, with some reportedly netting as much as $10,000 per day from their creations. While a number of third-party firms make antivirus software for OS X, Apple has also worked to add built-in protections. Apple debuted a system known as XProtect —which automatically quarantines files based on a frequently-updated list of malware downloaded from Apple's servers —alongside Snow Leopard. The company then added Gatekeeper, which is designed to prevent users from "unknowingly downloading and installing malicious software" by helping ensure that only software from the Mac App Store or registered Apple developers can be run, in Mountain Lion.